What is the Home Owners’ Association? Upon purchasing a unit in the West Campus Point faculty housing, the owners automatically become members of the West Campus Point Home Owners’ Association (HOA). The HOA is responsible for all HOA property and improvements outside the footprint of your unit (the Common Area), and the HOA is also responsible for maintenance and repair of the exterior “envelope” (paint and roofs, but not windows or doors) of each unit. The HOA collects dues from all homeowners to cover the expenses associated with fulfilling its responsibilities. Common Area Lease from the UC Regents. The HOA is in the process of making these documents available for viewing and download from this website. How is the WCP HOA governed? The West Campus Point Home Owners’ Association is governed by an elected board of volunteers who live at West Campus Point. The board meets roughly once a month, and otherwise as needed, to make decisions for the WCP HOA. Meeting notices are sent out with the monthly newsletter and posted on the mail kiosks in each cluster. To make decisions that require significant research and assessment, the board typically establishes committees. Committees can be composed of board members and non-board members. The names and e-mails of current board members are listed here. A list of current board members and all committee members is available for download. The board employs a management company to execute many business operations, such as dues collection, payment of bills and selection of contractors. As of March 2017, the management company is Coast Community Property Management, Sandie Foehl, is our property manager, David Foehl, her husband, assists, mainly with financials, and Lynn Farrell assists in the office. You can reach them by phone at (805) 968-3435 or by e-mail at sfoehl@msn.com. How does the HOA communicate with homeowners? HOA Board Meetings that occur roughly monthly, and which, by the Bylaws, are announced at least 4 days in advance. The agenda for meetings is distributed by e-mail (see below) and posted in the mailbox kiosks. Homeowners are welcome to attend but the meeting is structured with restricted time intervals for comment and discussion. Minutes of the meetings are distributed by primary e-mail listserv. The primary e-mail listserv, which only the HOA president and the property management company may use to send messages. The primary e-mail listserv is for business including meeting announcements, minutes, billing, alerts, and the monthly newsletter. Visit http://westcampuspoint.net/e-mail-lists to verify that you are on this listserv; you may not opt out of the primary e-mail listserv, and it is important that accurate e-mail addresses for owners are there. If there are any problems, please contact the list managers, Harold Marcuse, marcuse@history.ucsb.edu or Dorothy Gonzales, DRGonzalez@cox.net. The monthly newsletter, distributed via the primary e-mail listserv, which has information of interest to homeowners, such as the time and place of the next HOA meeting, the schedule of upcoming maintenance projects at WCP, and maintenance tips for WCP homeowners. A secondary listserv, the WCP community list, which is available for all members to initiate and/or participate in email discussions, such as requests for recommendations for plumbers, electricians, contractors, etc., and for notices concerning use of the pool area, Palm Plaza, or other parts of the Common Area for social events. The secondary listserv is also managed from http://westcampuspoint.net/e-mail-lists; you may opt out of the secondary listserv. How often does the WCP HOA board meet? The Board meets as needed, usually around once a month. Each meeting’s time, location and agenda is finalized at least five days before its scheduled date and distributed to homeowners. Board meetings are usually held in a board member’s home. The one exception being the HOA Annual Meeting, which is usually held during the first week of December at a venue large enough for all homeowners to attend. May anyone attend HOA board meetings? Homeowners are entitled (and welcome) to attend regular board meetings, which are typically held once a month, at a time, place and agenda announced to the community at least four days in advance. The agenda for every regular board meeting begins with a “homeowner’s forum” during which homeowners are welcome to speak and bring issues to the board’s attention. If an issue is not already on the agenda for the meeting in which it is raised, its discussion will be deferred to a future meeting. Homeowners are entitled, and especially encouraged, to attend the Annual HOA Meeting, which requires a quorum of homeowners to do business. Homeowners who are unable to attend may fill out a proxy form, to help ensure that a quorum is obtained. The Annual Meeting agenda includes reports from standing committees and ad hoc committees, as well as the election of Board members to one-year terms. Can the HOA board meet without notifying homeowners? No. California law is explicit on this matter. From time to time the Board may meet in an Executive Session, from which homeowners are excluded, to deal with a specific set of matters: primarily contract negotiations or matters pertaining to financial obligations of a particular homeowner (e.g., non-payment of HOA dues). California law restricts board members’ interactions outside of posted HOA meetings; in particular, a quorum of board members (at WCP a quorum is three) may not discuss HOA issues outside of an announced meeting. Are HOA board meetings’ minutes distributed to homeowners? The Board Secretary, or another designated person, takes minutes during regular meetings. A draft of the minutes is circulated to those who were present and presented for approval at the subsequent board meeting. Approved minutes are distributed via email, usually together with the WCP Newsletter, and the HOA’s monthly financial statement. Minutes from the WCP Annual Meeting are prepared in draft form and distributed to homeowners in draft form soon after the Annual Meeting, and presented for approval at the following Annual Meeting in December. How does the HOA budget work? Every year, based on past years’ expenses, the management company draws up a proposed HOA budget for the following year. The HOA Board votes to amend and, ultimately, approve the budget. The past year’s finances are reviewed and the coming year’s budget is shared with homeowners at the Annual Meeting every December. The HOA maintains both an operating account, for regular maintenance and planned expenses, and financial reserves, for large, planned expenses (e.g., roof replacement). In the event of large, unplanned expenses, the HOA can draw on reserve funds to avoid taking loans or levying a sudden, special assessment on homeowners. Replenishment of reserve funds then becomes a budgetary priority. Homeowners receive a WCP monthly financial statement listing HOA income (primarily from homeowner remittances), HOA expenses (both monthly and year-to-date), and the level of the HOA’s financial reserves. Every three years, the HOA Board performs a Reserve Study to assess the adequacy of the financial reserves. Specifically, the board establishes a committee of WCP residents, which may or may not include board members, and hires a reserve study specialist, who calculates the reserves needed to pay for major planned and unplanned maintenance. These include items such as repairs and replacement to asphalt , pool and Jacuzzi equipment, and landscape infrastructure. The calculation is based on estimates of the lifetime of a particular component and of its replacement cost. The HOA has traditionally funded reserves at 85%, effectively underweighting expenses that are projected more than a decade out. How is the monthly bill I receive from the HOA calculated? All homeowners pay a flat monthly fee to the HOA, which is set by the HOA board when it approves the annual budget. The fee covers the cost of property management and maintenance, as well as scheduled repayments on the leak remediation loan, which increases by 5% each year until paid off. Each homeowner’s monthly bill also includes water-related charges. There is a charge for the unit’s potable water use, which fluctuates due to variations in homeowner use and the interval between meter readings. There is also a meter fee, to cover the cost of reading/replacing the meters, and a sewer fee for disposal of that unit’s waste water. Finally, each unit is charged for its share of the recycled (non-potable) water used for irrigation. The recycled water bill comes as a lump sum, which is divided by 65, the number of units at West Campus Point, and charged to each unit. What other charges are homeowners responsible for? Homeowners who are active UCSB faculty have the land lease charge for West Campus Point taken as a deduction from their monthly pay checks. Homeowners who are retired UCSB faculty are billed by the university on an annual basis for the land lease. Homeowners are responsible for their unit’s utilities: trash collection, gas, electric, and cable/internet. Homeowners are responsible for insurance on their personal property, liability, and contingencies such as burst pipes, natural disasters including earthquake, fire, and flood. The HOA carries insurance for the units’ exteriors and the common areas at West Campus Point. Can I improve my unit and have improvements added to the base value of my unit? Homeowners may request costs of capital improvements to the interior of their units (e.g., major kitchen or bathroom renovations) be incorporated into the base price of their unit if approved by the WCP Architectural Review Board. The form for homeowner applications to the ARB is available here. Note that ordinary maintenance, such as painting or replacing carpet, is not considered a capital improvement. Can I rent my unit? As specified in the CC&Rs, you can rent your unit for no less than a month and no more than a year. Thus, you cannot use your unit for a rental business (e.g., via Airbnb) and it must be your primary residence. Following a one-year rental, you may be permitted to rent for a second year, but your request must be made to and approved by the UCSB administration. Your tenants are required to abide by the CC&Rs. You are urged to contact your insurance company to understand the conditions of your coverage when renting your unit. How do I shut off the water to my unit? Is there a waste bin somewhere nearby for kitchen waste, compost? Yes! There are three large black bins next to West Campus family student housing. They are located at both ends of the garden plot area right across from the apartments. Walk to the end of WCP Lane and cut through to the road on the other side. You will see the compost bins just this side of the road. 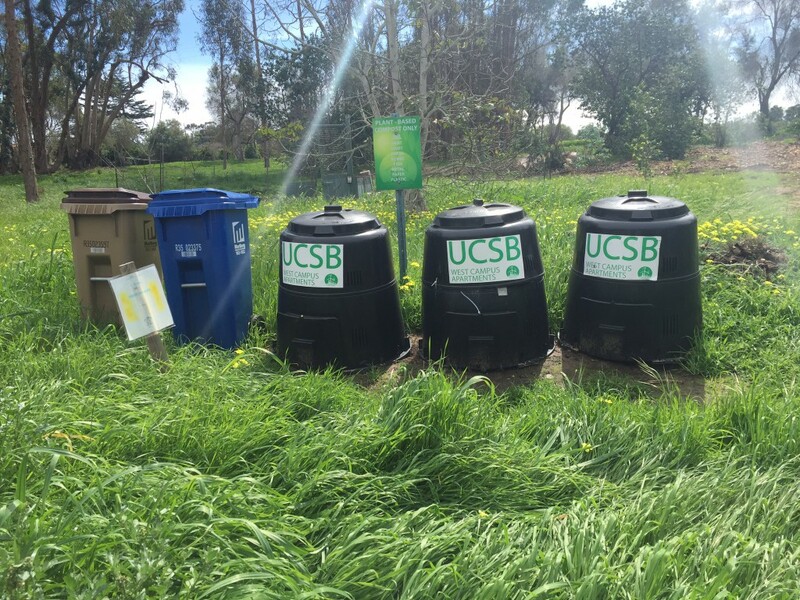 They are courtesy UCSB Associated Students’ Department of Public Worms, which maintains them and takes care of composting the food. What do I do if I have a question or concern about my unit or one of the common areas? Please communicate any questions or concerns you may have about your unit or the common areas directly to our property manager, Sandie Foehl, at Coast Community Property Management, by calling (805) 968-3435 or e-mailing sfoehl@msn.com. Her office always tries to answer the phone during regular business hours (9 am to 5 pm, Mon – Fri), but if they are unable to take your call, be sure to leave a message. Someone will return your call within 24 hours. Note that they give voice-mail priority over e-mail. So, if what you have to say is time-sensitive, please call! Again, do not email with an emergency! They will not be able to respond as promptly as may be necessary. However, for non-urgent, and especially for complicated requests, sending an email works well. They generally responds to e-mail within 48 hours. What are homeowners’ responsibilities for maintenance? With few exceptions, such as the solar system, homeowners are responsible for all maintenance on the interior of their units. A document detailing homeowner maintenance responsibilities is posted on this website under the tab “Documents”. How can homeowners communicate with other homeowners at WCP? WCP has a community discussion list which homeowners may choose to join. The list is for internal communications and its membership is exclusive to the community. Please let the management company know if you wish to be included. Homeowners should use the list responsibly, paying attention to keeping discussions on the list respectful, civil, and to the point. Common uses include requests for recommendations of commercial vendors of various kinds: plumbers, electricians, carpet cleaners, painters, handymen, etc. The WCP Community list allows for reply to all, which is often requested when it comes to such referrals because our units have so much in common. When planning a social gathering in the Palm Plaza or a pool party, please post to the community list with the time your group will be using common facilities. The community list should not be used for political purposes or to discuss political issues. Note: The HOA also has a WCP Announcements list, to which all homeowners must subscribe. The board president and the property manager have exclusive use of this list to post important messages to homeowners. The Announcements list does not have a reply function. As laid out in the CC&Rs, homeowners are permitted to have a total of two ordinary pets (such as cats and dogs). Homeowners’ pets should not cause a nuisance to other WCP residents. In particular, dog owners must keep their animals on leash and clean up their solid waste when out of doors. Note that the open field immediately south of WCP is part of a public and permanent natural reserve. Dogs must be on leash in this area and owners must pick up their animals’ solid waste. Homeowners may plant non-invasive plants within the walls of their side and back patios. Homeowners may also plant in the strips of soil next to the carport and fireplace of their unit, provided that they contact the management company so that the landscape company knows which units are not part of their regular maintenance. Homeowners that opt for maintaining their carport and/or fireplace strip are expected to keep it well trimmed and free of weeds. Homeowners may not plant in the common area of WCP. Complete planting regulations and other landscaping matters are posted here. Where can I properly dispose of green waste? 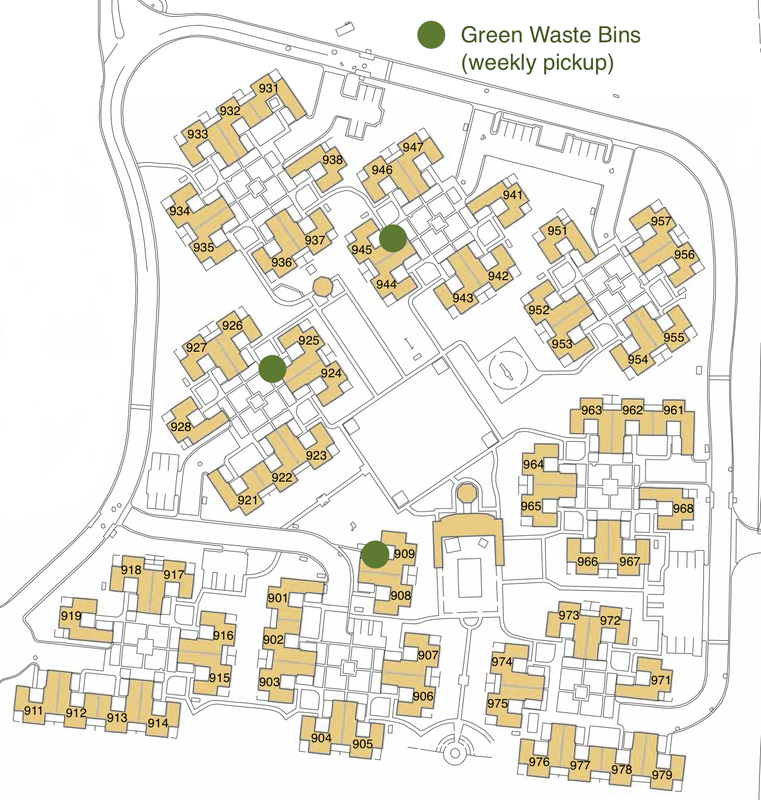 For WCP Neighbors, the HOA currently provides three green waste containers; one in the 900s (at 909), one in the 920s (at 925), and one in the 940s (at 945). See map below. Where may I park my car other than my carport or garage? General parking spaces are available adjacent to every cluster. It is optimal to leave the spaces in these parking lots for visitors, but homeowners may use them. Please, be courteous. Most notably, if you are away for an extended period of time, such as on sabbatical, please do not leave a car in a visitor lot. Note that parking is prohibited in the autocourts and on the perimeter road. This is so that emergency vehicles can have access. Full parking regulations can be found here (make this a link!). Who may use the pool? The pool is a common area for the exclusive use of WCP residents and their guests. Each unit is issued a key and key paddle. If you lose it, contact the management company for a replacement at cost. Children under 14 years of age may not use the pool or Jacuzzi without a supervising adult present. Click here for complete list of pool regulations. May I use the pool or another common area for social gatherings? Homeowners wishing to host an event in the common areas (e.g., a party at the pool, a barbecue in Palm Plaza) are requested to send a message on the WCP community listserv to alert neighbors to the proposed use. Please dispose of any trash resulting from your event. Is it okay to leave toys near the pool and in other common areas so all children at WCP can benefit? A general spirit of neighborly sharing is welcome. However, adult residents should be attentive to whether toys and furniture left in the common areas may present a hazard. This is especially critical in the pool area. Anyone supervising children or novice swimmers needs clear access to that area. People with vision problems, including people without their glasses, should not have to encounter trip hazards as they access the pool. For the safety of all using the pool area: please help keep toys (and chairs!) out of the immediate vicinity of the pool and jacuzzi. 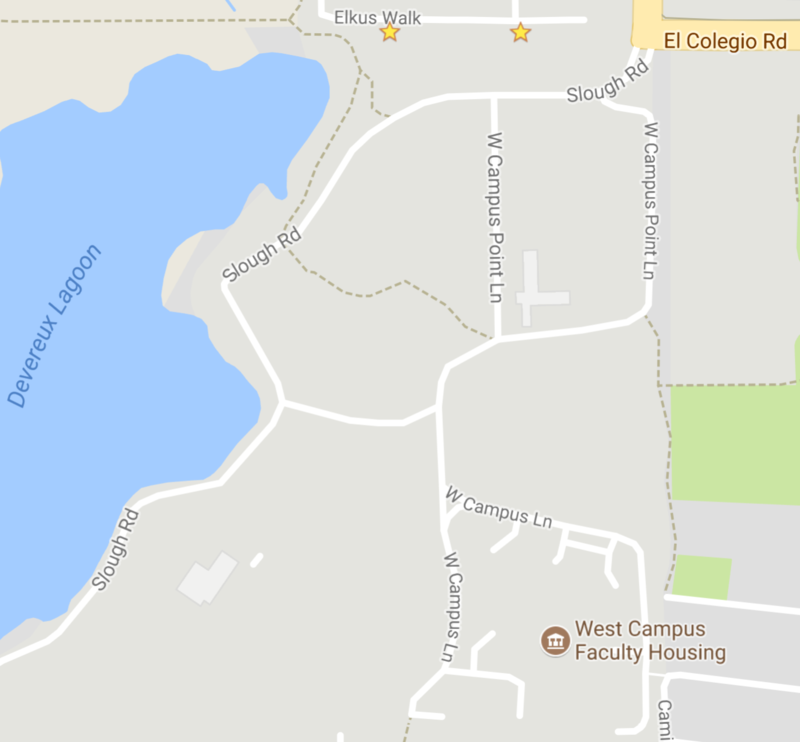 Who manages the West Campus Point property? In March 2017, West Campus Point contracted with Coast Community Property Management. Sandie and David Foehl are our property managers. They work as a team, with Sandie taking the lead in administrative matters and Dave taking the lead on financials. Lynn Farrell assists in the office. You can reach them by phone at (805) 968-3435 or by e-mail at sfoehl@msn.com. What exactly does the management company do? The management company oversees the contracting of work in the common areas of West Campus Point for Home Owner Association projects, as well as work on individual units that are the HOA responsibility. It obtains bids for projects, keeps track of contracts, and assures timely payment of bills. The management company should be the first contact homeowners have concerning maintenance issues that are the HOA’s responsibility. Note: virtually all maintenance issues inside a unit are the homeowners’ responsibility. The management company also prepares and distributes the monthly HOA bills for homeowners and collects the revenues. It prepares the monthly financial statement for the HOA and draws up a proposed budget for the following year. (The HOA Board reviews the proposed budget and votes on its approval.) It distributes this information to homeowners, along with a newsletter, in monthly e-mailings. Is the manager available after hours in case of an emergency? Yes! Coast Community Property Management has a person on-call 24 hours a day. For urgent matters (i.e., any time there is an immediate threat to property), call (805) 968-3435. Their voice-mail has and emergency option that will connect you to an operator who knows how to contact Sandie at all times. In case of fire, medical emergency, or any other potentially life-threatening emergency, call 911 first. 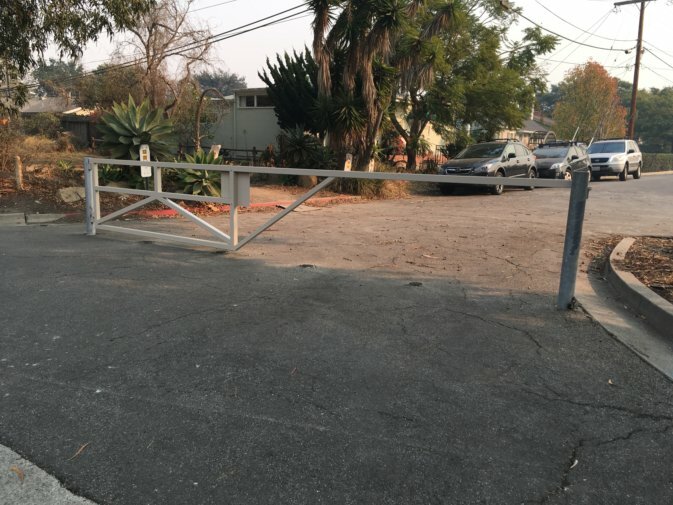 Who has the key to the East Gate for emergency access to/from Isla Vista? 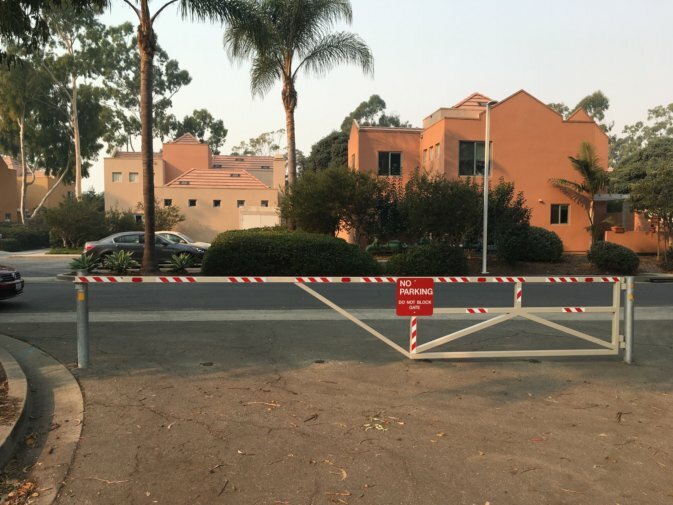 Emergency access between West Campus Point and Isla Vista is possible through a gate on the eastern perimeter. The gate is locked with a padlock at its south end. 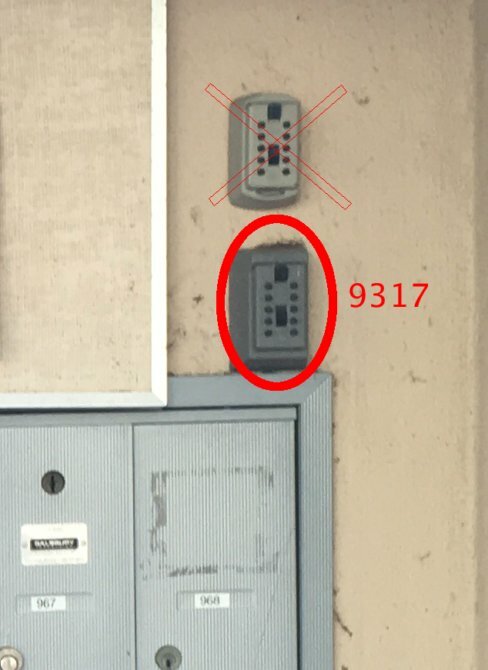 The current Board president (Deborah Fygenson) has one copy of the key, the former Board president (Kary O’Brien) has another, the property manager (Sandie Foehl) has a third, and a fourth copy is stored in a lock box above the mailboxes in the kiosk at the entrance to the 960’s. What does a flashing green or flashing red light at the WCP sewer pump station mean? The WCP sump reservoir has two pumps, a primary and a backup. 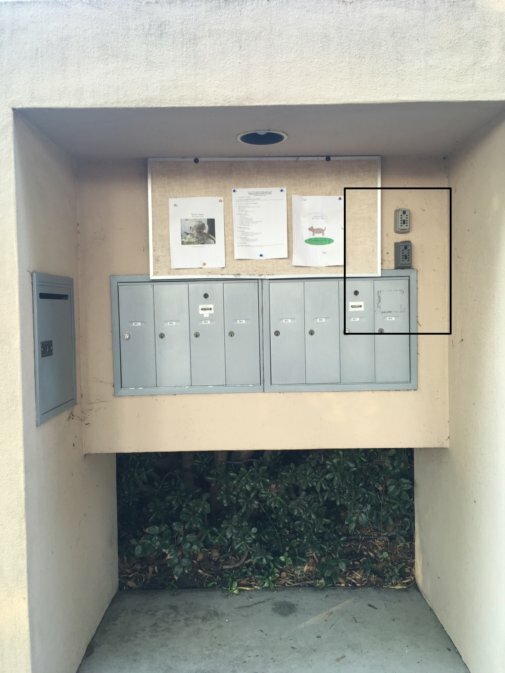 The sewer pump control box is situated at the north of the complex, directly across the street from unit 942. The primary pump goes on when sewage reaches ~2.5′ in the sump. The secondary goes on when it reaches ~4.5′. A green flashing light means the primary pump has failed and the secondary pump is working. A red flashing light means that neither pump is working and the level in the sump is above 5′. The sump is ~15′ deep; when it overflows it shows up as water coming out the sewer manhole in the middle of the street. It can hold a LOT of sewage, but it’s not good to test it out, and it is a violation to put untreated sewage into the storm drain system (where it eventually goes). In March 2017, residents noticed a glitch after a scheduled power outage: the green light remained flashing even after power had been restored, the sewage level was below 2.5′, and everything was functioning normally. It appears that the green light has to be reset by hand. If the lights are flashing (and it isn’t due to the glitch just mentioned), call Gary Fuller at (805) 637-5559. Gary is a general electrical and plumbing contractor, who has helped out at WCP for many years. (For example, as of March 2017, he is contracted to read our water meters.) If Gary encounters any sump issues he can’t handle, he calls up a Ventura-based company (Oil Fields ?) that charges a pretty penny ($150/hr from point of departure) but has been able to resolve any problem Gary has ever encountered. Why should WCP residents avoid running water down the drains or flushing toilets during a power outage? Sewage from WCP is directed to a sump which must be actively pumped to leave the property. There are two pumps, a primary and a backup, both of which run on electrical power from Southern California Edison. If residents are not conscientious during a power outage, the sump may overflow. When it overflows it shows up as water coming out the sewer manhole in the middle of the perimeter road on the north end of the complex, and flows into the storm drain system, which flows directly to the ocean. According to Gary Fuller (the plumber who has serviced our sump and pumps over the years), our sump can hold approximately 3000 gallons of sewage. This means that, if the pump stops working, each household can send only ~45 gallons of water down its drains before the sump overflows. A typical toilet flush sends ~ 2 gallons of water down the drain. A typical dishwasher sends ~ 6 gallons of water down the drain. A typical clothes washing machine sends ~ 30 gallons of water down the drain. A typical shower sends ~ 2 gallons of water per minute down the drain. Therefore, during an extended power outage, WCP residents should avoid water intensive activities like washing clothes or dishes or taking showers, and limit themselves to < 20 toilet flushes, in order to prevent the sump from overflowing.